Why do sharks attack? Sharks are carnivorous and may be found in all seas. Sometimes, they associate humans with food. 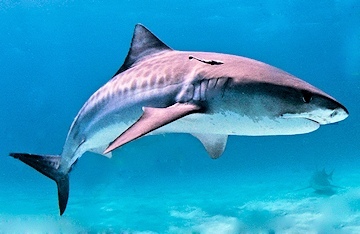 Sharks do not usually live in fresh waters, but there are exceptions: the river shark and the bull shark. Most sharks are found around 2,000 meters (7,000 feet) below sea level, in warm environments, but they can also be seen in shallow waters. While nearly five people lose their lives, every year, due to shark attacks, more than 100 million sharks are killed annually for commercial purposes. 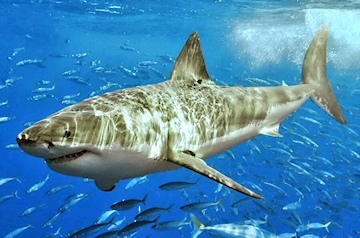 Surfers are an easy target for sharks, especially in Australia, South Africa and California. Fortunately, there are effective electronic devices that repel sharks by sending electrical pulses designed to keep deadly predators away from wave riders. These anti-shark surf gadgets are detected by its sensory receptors, known as Ampullae of Lorenzini, causing mild-to-intolerable discomfort in the predator. The shark deterrent system may save your life in shark infested waters. You can use the electronic shark defenses in your surf leash or back in the tail of your surfboard. Smell, sight, hearing, electroreception and lateral line are the main shark senses. They provide critical information for the activation of protection defenses and attacks. The average shark life expectancy is of between 20 and 30 years, depending on the species. Sharks can reach a swim speed of 20 kilometers per hour (12 miles per hour), when preparing an attack. 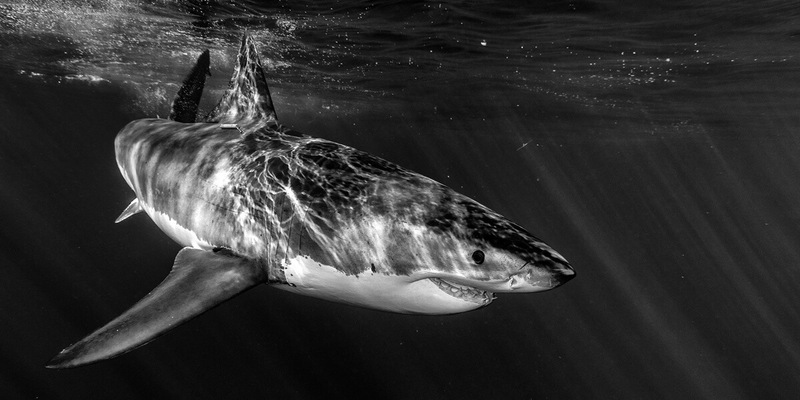 Great white sharks can even peak at 50 kilometres per hour (31 miles per hour). The most dangerous and deadly species are the great white shark, the tiger shark and the bull shark, but there are over 400 species of sharks. Get details about shark-infested surfing regions. 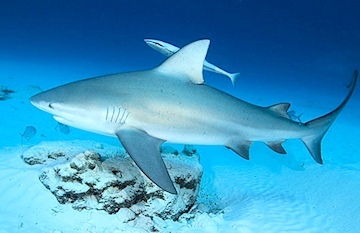 The requiem shark, the sand tiger shark, the black tip shark, the narrow tooth shark, the hammerhead shark, the spinner shark and the blue shark complete the list of the 10 most lethal species of underwater predators. If you sight a shark in the water, first of all, stay as calm as possible. Do not swim or paddle fast to the shore, otherwise you'll ignite a shark attack. Track the shark and try to understand if the animal is swimming around or preparing an attack. Try to find obstacles, corners, cliffs, rocks, boats or shallow waters. If you're scuba diving, make air bubbles. Sharks don't enjoy bubbles. Sharks are strong, but they can be beaten. If a shark attacks, defend yourself by hitting the predator in the eyes and gills. There's a good chance that he will leave the scene. Finally, swim to the shore. Blood loss should be immediately stopped with clothes, while the medical teams arrive to help you. The International Shark Attack File has been building and updating the largest shark database in the world, with individual investigations of shark attacks worldwide. The fear of sharks is known as galeophobia. Panic, racing heartbeat, nervousness, mental anguish and even dizziness are the most common symptoms when fearing sharks. Shark phobia can only be treated with hypnotherapy and psychotherapy. Get an in-depth look at how to survive a shark attack. Sharks are known for their accurate vision. High contrasts are easily spotted by sharks underwater. Yellow, white and red rash guards and wetsuits are especially visible to sharks, so surfers should avoid them in particularly classic shark-infested waters. Light reflection caused by watches, jewelry or metal gear, should be reduced, too. Dark blue surf gear is always a good option. Shark Culling: Yes or No? In response to fatalities caused by sharks, there has been a lot of pressure in shark-infested countries to do something. As a result, many national authorities decided to cull sharks with nets and drum line programs. However, it's been proved that these measures are not effective. Learn why shark culling is not the answer.